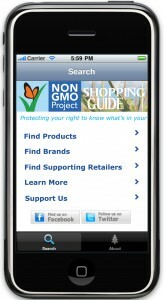 Non-GMO Project Shopping Guide, designed to support consumers in knowing what’s in our food and avoiding GMOs, this app features a list of the brands and products that are enrolled in the Non-GMO Project’s Product Verification Program. The Non-GMO Project’s program is the ONLY third-party non-GMO verification program in North America, and “Non-GMO Project Verified” is the only non-GMO claim backed by transparent and rigorous standards. The Non-GMO Project is a non-profit organization originally founded by retailers committed to providing consumers with reliable non-GMO choices.